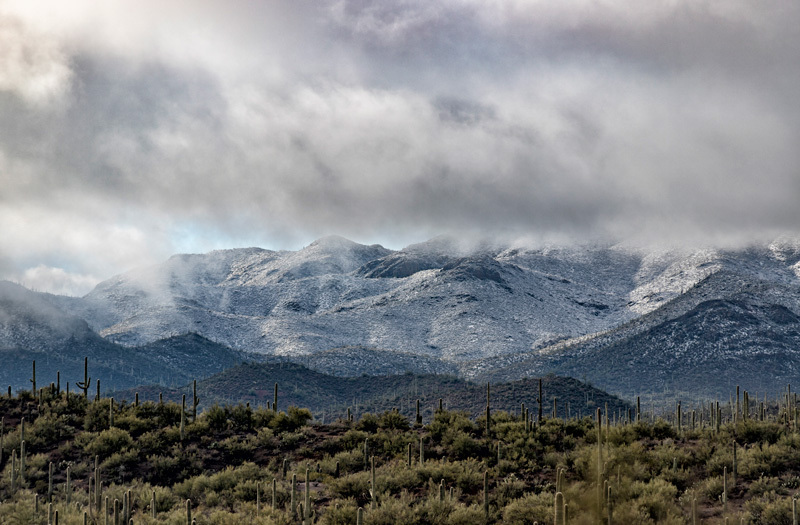 I moved to Tucson in 1985 to attend the University of Arizona, graduating with a Bachelor of Arts degree. I fell in love with Tucson and the Sonoran desert and never left. I am an avid night sky photographer, taking pictures of the Milky Way galaxy and star trails. I also take pictures of astronomical events like eclipses and meteor showers. I have always been interested in photography, starting out in 35mm film and then converting to digital. My major in college was radio/television with a minor in art. Many of the elements of composition from video cross over to film. What I love about still photography is the ability to capture a moment in time and preserve it forever. Photography is an art that can transform the viewer to another place and time. It can evoke emotions and memories from the past, and it can inspire the viewer to go to places they have not seen. In night photography I love the fact that I can use my skills as a photographer to produce images that the eye cannot see. A good example of that is what we call star trails. In the image the stars appear to trail across the sky. The stars, of course, are not moving, we are. The rotation of the earth causes the movement, the stars are stationary. It is only through the use of a long exposure or a composite image, that the trails can be seen. A long exposure requires very dark skies. The disadvantage of the long exposure, is that it can be ruined by a stray light from another person, or a stray vehicle. Another technique for creating star trails, is a composite image. Created by stacking images and blending them together. I prefer this method, because it allows me to take images with not as dark of a sky, and it also allows me to be able to eliminate any unwanted images in the series. The picture I took of the Lost Dutchman State Park is a 30 minute exposure. The circular star trails image is thirty images that are stacked and blended. 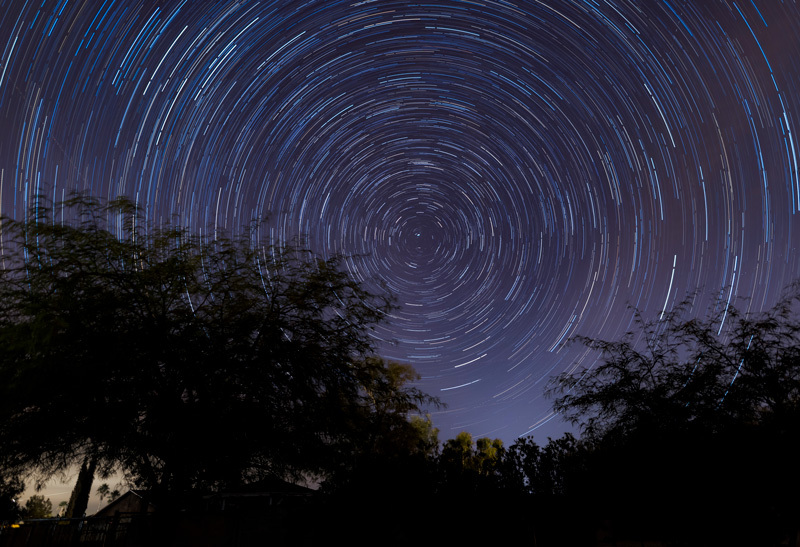 When you compose an image facing north, the stars appear to move in a circle around the north star Polaris. Tucson is a dark sky city. What that means is the International Dark Sky Association has designated the community as a dark sky city. A dark sky city is a community that takes steps to reduce the amount of light pollution to preserve the night sky. 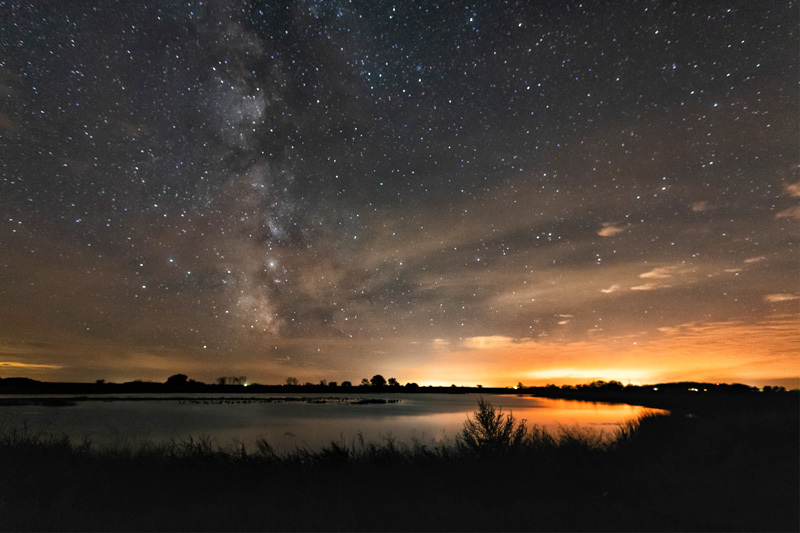 The community implements and enforces a quality outdoor lighting ordinance, engages in dark sky education and the citizens support dark skies. Tucson converted thousands of street lights from high and low pressure sodium luminaries to white light emitting diode or LED from 2014 to 2017. 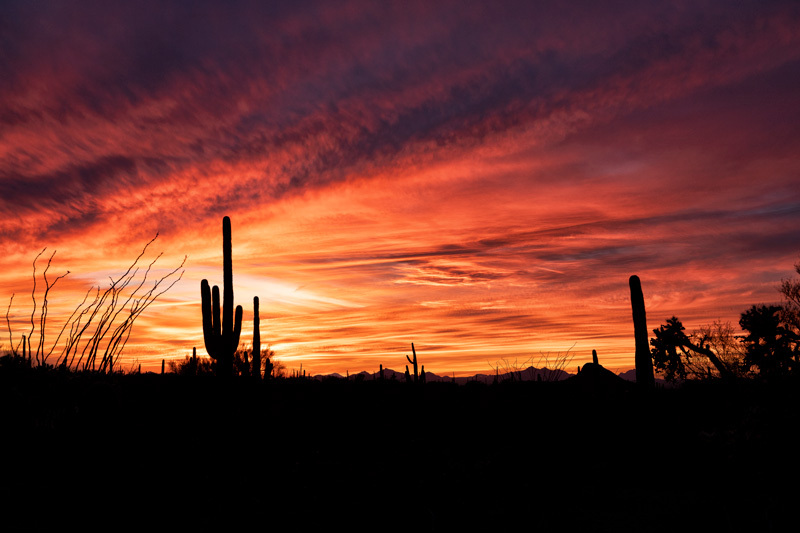 Tucson has effectively reduced the skyglow over the city by 7 percent. Tucson is the home of the International Dark Sky Association. 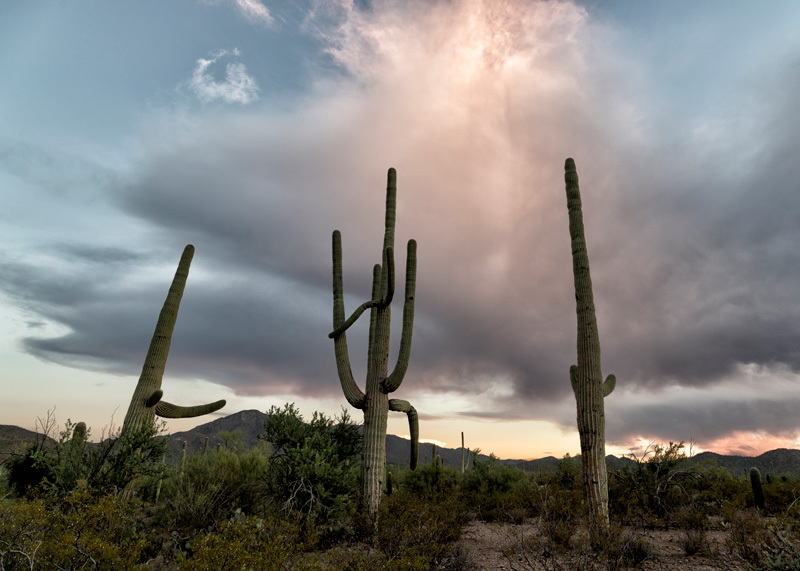 The beautiful mountains surrounding Tucson provide great natural light shields, blocking the sky glow. The mountains are also home to numerous telescopes that take advantage of the dark night skies. The mountains also provide a nice foreground for taking pictures of the night sky. 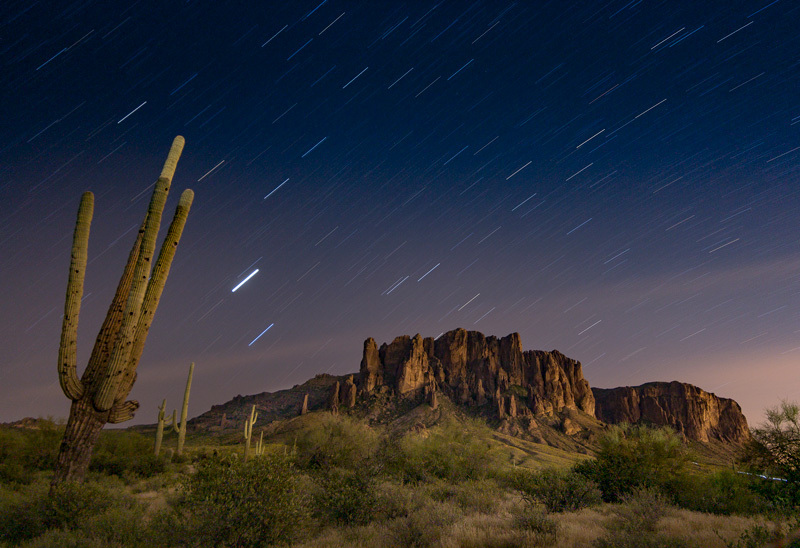 Arizona has nine recognized International dark sky parks, three of which are here in southern Arizona. They are Tumacacori National Historic park, Oracle state park and Kartchner Caverns State Park. The desert climate here in southern Arizona provides many clear nights for star gazing. I really enjoy taking pictures of the moon, particularly lunar eclipses. Last year on January 31. We had the rare opportunity to see a Super Blue Blood Moon. The combination of the super moon, blue moon and blood moon had not been visible in the United States since 1866. A super moon occurs when the moon is in its closest orbit to the earth, causing it to appear larger. A blue moon, is the second full moon in the same month, normally there is only one full moon in a month. A blood moon is a total lunar eclipse, the moon will turn orange and red when the eclipse reaches totality. I took over 300 images of the eclipse. What I like to do for an eclipse is to show the progression of the eclipse in a series of images layered next to each other. I also love the fact that when the moon is eclipsed you will be able to see the stars again, because the sky is darker. 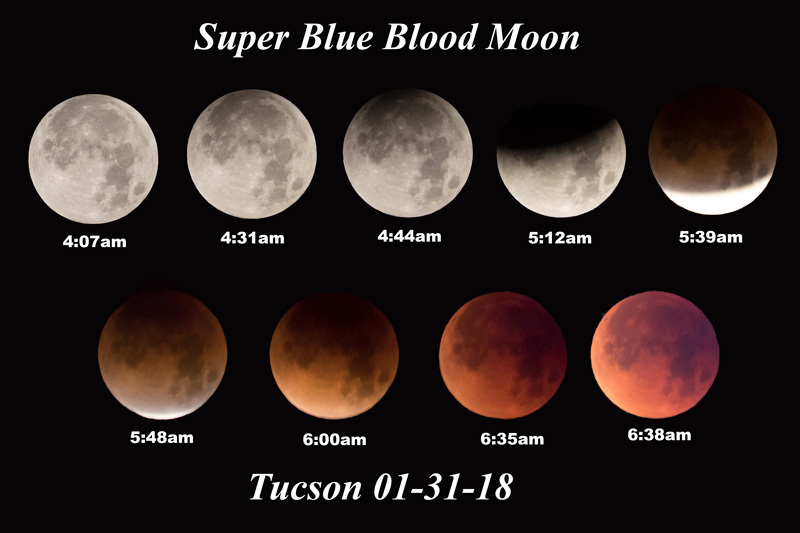 The next total lunar eclipse that is visible in Tucson will not be till May 20, 2021. As a night photographer I am always conscious of the phases of the Moon, because it determines the type of night photography. The days approaching, during and after the new moon, is the best time to see dark skies, and photograph the Milky Way galaxy. 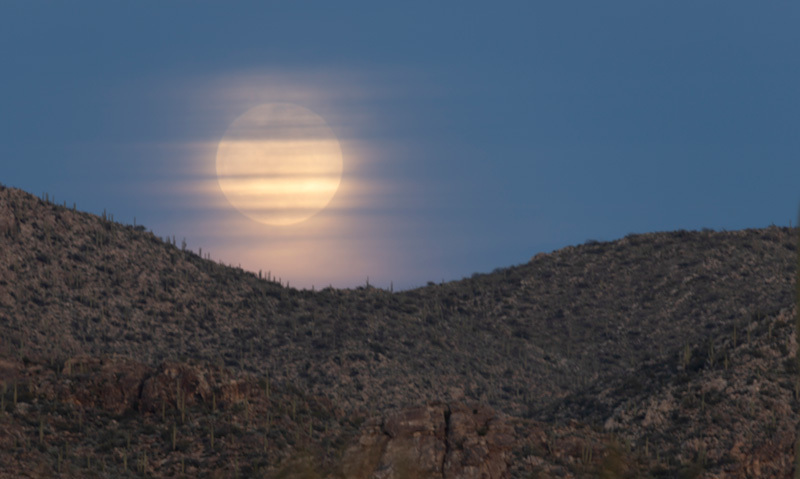 During the rest of the month, when the moon is visible, you can still take advantage of night photography, because you can take beautiful pictures of landscapes lit by the light of the moon. It doesn’t have to be a full moon either, the light of the quarter moon, provides more than enough light to illuminate the land scape. This is another case, where your human eyes, can not see the colors of the landscape, because when the sun goes down, we can see mostly shades of grey, but when you take a photograph exposed correctly for the moonlight, the colors of the landscape come to life. It will look like the picture was taken during the daylight, but the cool thing is that you can still see the stars too. Meteor showers are another astronomical event that can be photographed. Catching meteors in your image, can be very challenging, I have spent many meteor showers, enjoying the show, but not capturing an image because of the timing or placement of the camera. It is still a joy to take a lawn chair and just enjoy the show. The Perseids meteor shower is very popular, because of the brightness and number of meteors, the peak viewing will be August 12-13. During the hot summer months, it is nice to get out in the desert at night time. The desert comes to life, because the heat of the day dissipates quickly in the desert and the coolness brings out all kinds of critters, including humans. Not all of my photographs are of night skies. One of my other passions is storm chasing. 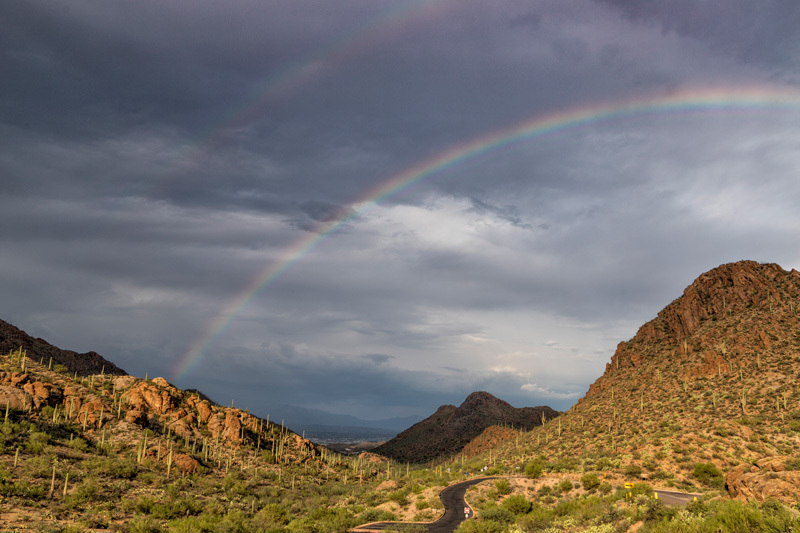 Monsoon season in southern Arizona is best time of the year to photograph storms. 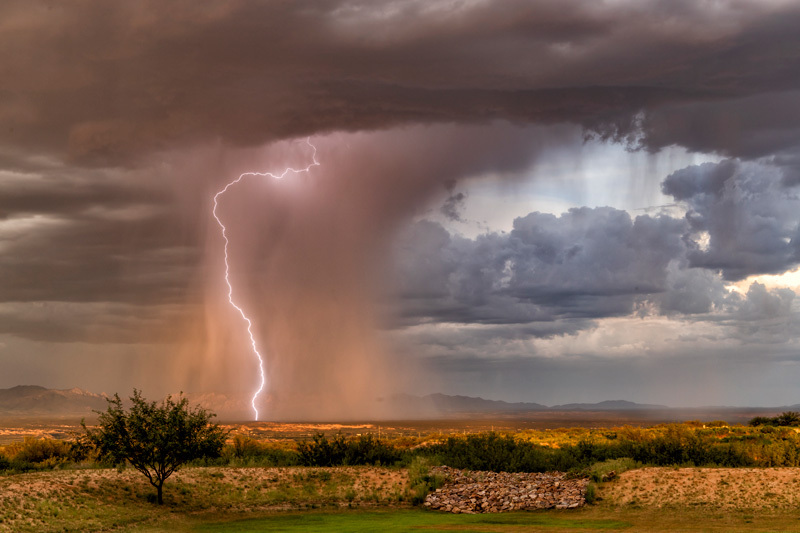 Our monsoons provide dramatic storms cells, full of energy, and the opportunity to photograph lightning. Storm chasing can be very dangerous, you must be cautious of the lightning and the extreme flash flooding that can catch you unaware if you are not prepared for it. The best photos I have taken are outside of the storm cells, that is where you want to be. If you are inside the storm cell, it can be very hard to get photos, and stay dry. Storm chasing is a new adventure for me. I haven’t been doing it as long as I have night photography. It is an adrenaline rush and I can see how storm chasing can become addictive. I am looking forward to the monsoon season this year, I am hoping to get better at it.